The beautiful fall months provide a bounty of fun and exciting decorating ideas that don’t have to cost you an arm and a leg. 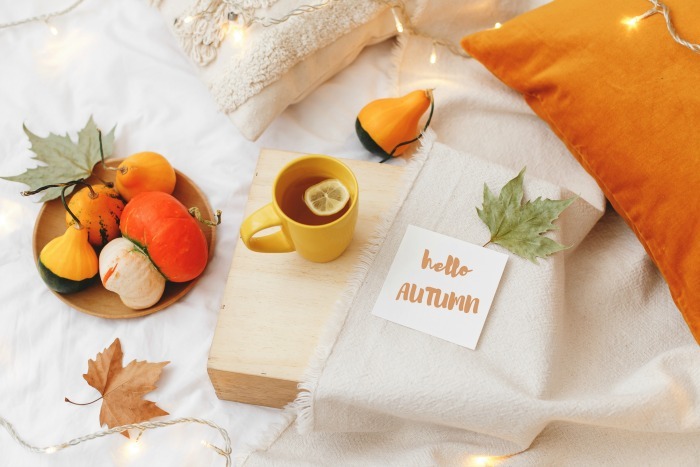 From crunchy leaves, warm colours, plenty of pumpkins and beautiful flowers, autumn is one of the best times to freshen up your home’s indoor décor. And, updating your indoor space for the fall months, doesn’t have to be expensive. 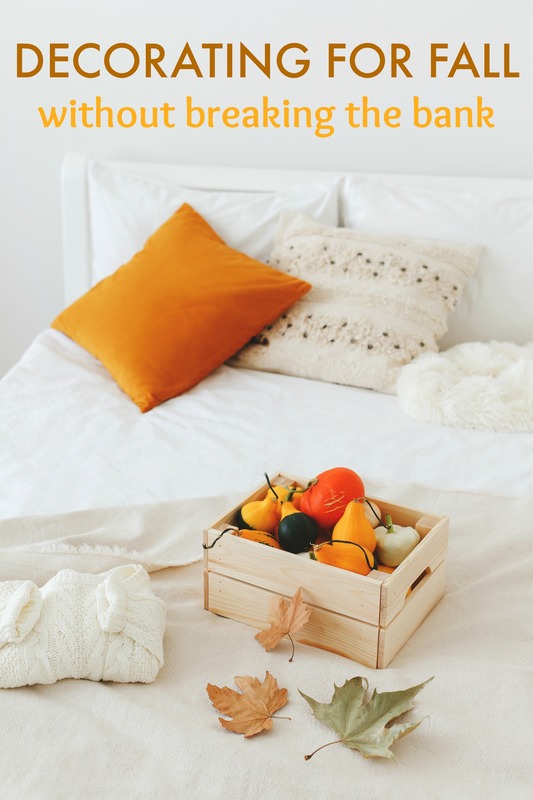 In fact, there are several frugal indoor fall decorating ideas you can use to add autumn charm, colour and warmth to your space. Check your local supermarket or garden center for pumpkins, gourds or even the small pie pumpkins. Using a knife, carefully remove the top and carve out at least 1 inch deep of the inside. Then, fill with a little bit of water and add seasonal flowers like chrysanthemums for a beautiful table display. Slice apple into thin strips and dry on low in your oven for an hour or two. String the slices on some coloured ribbon and hang from your doorway, mantel or anywhere else in your home that needs a little perking up. You can even sprinkle the apples with cinnamon before drying to make them more fragrant. This is a beautiful rustic addition to your fall décor. Your local dollar store is a fantastic place to purchase a variety of candles in different sizes and fall colours and assemble them on an autumn coloured charger plate. This makes a beautiful centerpiece for your table or on your mantel. Look for throw pillows, towels, runner and rugs in warm fall colours, changing them out with your other pieces. These items can be purchased at local retailers, dollar stores or thrift stores inexpensively and can make a huge difference to your space. PRO TIP: Collect a bunch of seasonal pillow covers that fit your throw pillows. They take up less storage space. You can also look for fabric remnants, tea towels, and other such items that can easily be stitched together to make your own. Using large bowls and baskets you already have on hand, you can arrange natural items beautifully. Things like gourds, apples, mums, acorns, pinecones, or anything else nature can provide for free will create a stunning fall display. Place them around your house in any spot that needs some autumn colour. When it comes to decorating your home over the autumn months, there are so many ways do it without breaking the bank. Choose warm colours and beautiful natural accents. Fall decor is a great way to make your home feel cozier. Indoor Fall Family Fun Activities to Keep Everyone Busy! I love these ideas. You did such a great job. I love the way you used it all to turn little pieces into a big change. This is so helpful! I’d love to go around my living room and make some comfy adjustments for the season. A few gourds and some garlands could make a big difference. My wife would find these inspirational. I find them to be very festive and welcoming and warming. Love the fall vibe. I love pillow covers! They allow me to swap my room’s looks effortlessly with just some fabric! I also love throws over my couches to complete the look. I’m all about the candles during the fall! They bring in great scents, a little extra heat, and make a great ambiance in every room! I love these ideas. That looks super nice. I love being able to have fall decor. It’s one of my favorite seasons, and it looks so beautiful. Cite stuff. I love fall décor, love the colors. 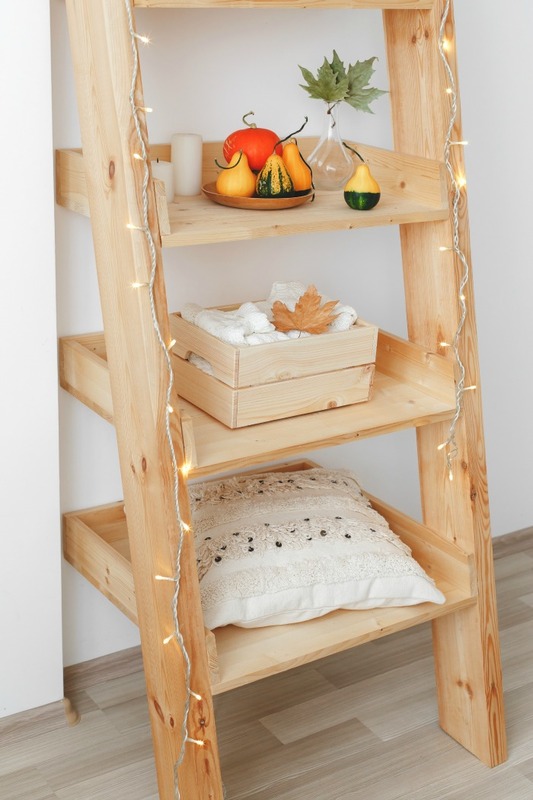 I am obsessed with this ladder decor. Simple and elegant yet seasonal too! I am very bad at seasonal decorating. I am bad at decorating in general so this shouldn’t be a surprise. I definitely like the natural decorations though. Wow your decorations are just beautiful. I love that you were able to do that without breaking the bank. Thank you for your tips. I have to say I enjoy decorating for fall second only to Christmas. These are all great fall decorating ideas. I’m still setting up my living room from our move and I would love to incorporate the fall season in my decor. Love how simple your decor is yet it’s so pretty. Isn’t fall the best decorating season!! So simple but so beautiful! I love this type of elegant fall decoration ideas! It’s amazing how anyone can decorate for fall without spending a ton of money. Your frugal fall decorating ideas are perfect for any budget savvy family. I am glad you shared these!